SOLD OUT. 24+ Seeds. (larger quantities available) These are perfect seasoning for chili, pickling, relishes, salsa, pica-de-gallo and making your own tabasco-like sauces. THESE ARE SUPER HOT! A member of the chinense species of Capsicum, which includes peppers such as habanero and Scotch Bonnet. All of these pepper varieties have Scoville measurements between 100,000 and 300,000. 24+ Seeds for Datil Pepper (aka: Minorcan, St. Augustine Pepper). Larger quantities sometimes available - see drop down box near order button for discounts. 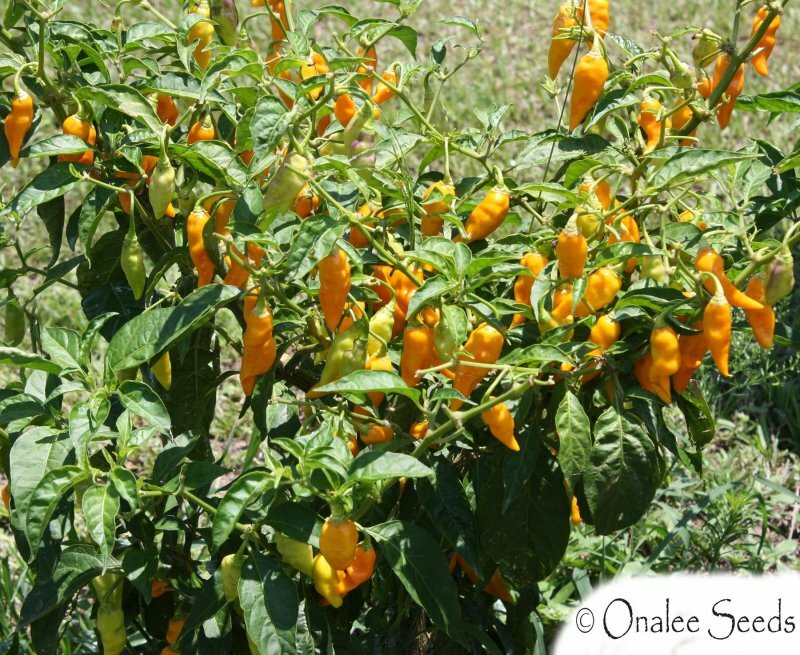 The datil pepper is a member of the chinense species of Capsicum, which includes some of the hottest of all peppers, such as habanero and Scotch Bonnet. All of these pepper varieties have Scoville measurements between 100,000 and 300,000. The datil pepper, when ripe, is orange, elongated in shape, and between one and three inches (2.5-7.6 cm) in length. These go from green (green peppers on the top of my bushes got a purple tint to them - I guess from the sun - really very pretty! ), to yellow to orange. These prefer full sun and sandy, well draining soil. They are hardy to USDA zone 9, but can be easily grown in containers and protected over winter. 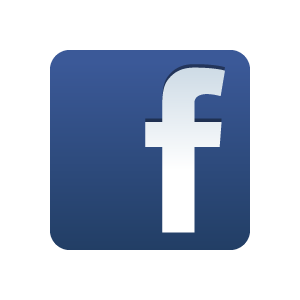 The plant will reach maturity in about three months. 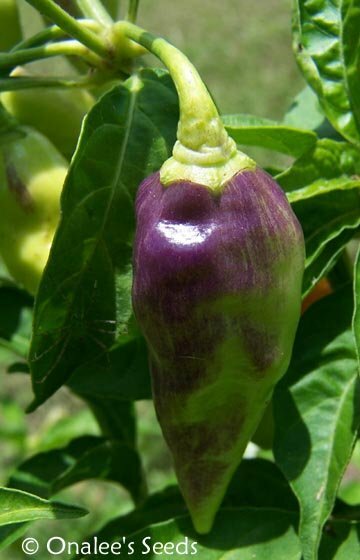 The datil pepper has been cultivated by the Minorcan community living in the city of St. Augustine, Florida since the 18th century (did you know that St. Augustine is our nation's OLDEST city?). It has been speculated that the peppers originated in the Caribbean, possibly brought to St. Augustine from Cuba by a jelly maker named S. B. Valls. 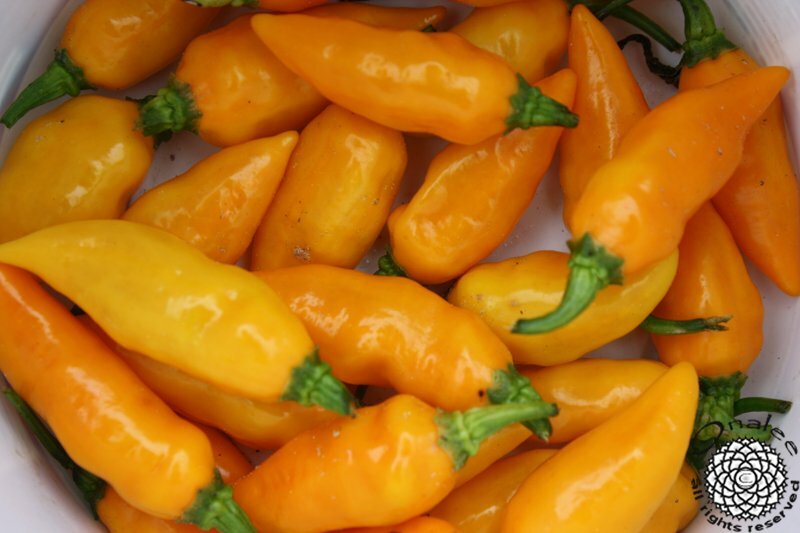 Fresh datil peppers and seeds can be very difficult to find outside of the St. Augustine area, although the plant can be grown anywhere.